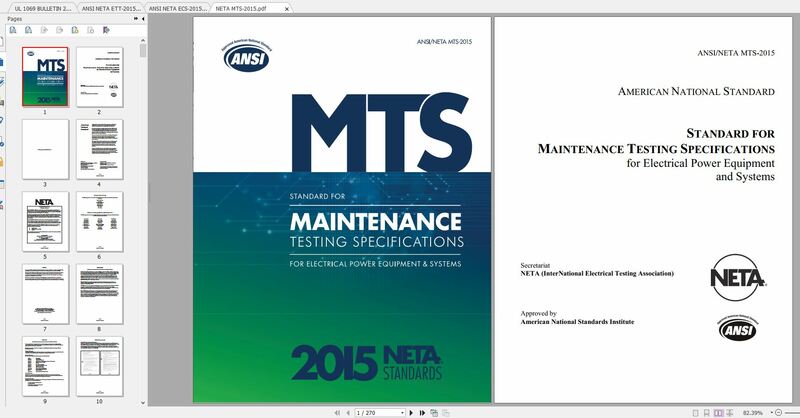 برای خرید استاندارد ANSI NETA MTS به تاریخ 2015 و باعنوان استاندارد Standard For Maintenance Testing Specifications For Electrical Power Equipment And Systems با گیگاپیپر مکاتبه کنید. پس از واریز هزینه فایل PDF استاندارد ANSI/NETA MTS-2015 که در آرشیو گیگاپیپر موجود است، ارسال می شود. نسخه REDLINE این استاندارد هم موجود است. These specifications cover the suggested field tests and inspections that are available to assess the suitability for continued service and reliability of electrical power distribution equipment and systems. The purpose of these specifications is to assure that tested electrical equipment and systems are operational, are within applicable standards and manufacturer’s tolerances, and are suitable for continued service. The work specified in these specifications may involve hazardous voltages, materials, operations, and equipment. These specifications do not purport to address all of the safety problems associated with their use. It is the responsibility of the user to review all applicable regulatory limitations prior to the use of these specifications. برای سفارش و خرید کلیه استاندارد های NETA با ما مکاتبه کنبد. پس از واریز هزینه فایل استاندارد انجمن جهانی تست الکترونیک ارسال می شود. برای اطلاع از قیمت فایل PDF استاندارد InterNational Electrical Testing Association مشخصات استاندارد ارسال شود. برای دانلود استاندارد صدور گواهینامه تکنسین های تست الکتریکی با مکاتبه کنید. استاندارد برای مشخصات فنی تعمیر و نگهداری برای تجهیزات برق و سیستم های قدرت به زبان انگلیسی موجود است. 1. 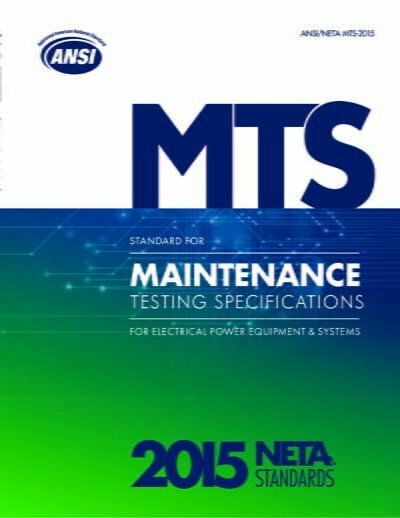 These specifications cover the suggested field tests and inspections that are available to assess the suitability for continued service and reliability of electrical power distribution equipment and systems. 2. The purpose of these specifications is to assure that tested electrical equipment and systems are operational, are within applicable standards and manufacturer’s tolerances, and are suitable for continued service. 3. The work specified in these specifications may involve hazardous voltages, materials, operations, and equipment. These specifications do not purport to address all of the safety problems associated with their use. It is the responsibility of the user to review all applicable regulatory limitations prior to the use of these specifications. برای اطمینان از کیفیت استاندارد ANSI/NETA MTS یک صفحه از استاندارد بصورت رایگان آورده شده است.